Fashion education has been long overdue for an update. Because of the interconnectivity provided by the Internet, the interdisciplinary nature of current fashion and design thinking as well as the changing demands of both the consumers and the fashion discipline at large, new educational philosophies, practices and models are beginning to emerge that challenge dated ways in which fashion should and could be learned. Address contributor Aïcha Abbadi maps some of the most exciting examples of future fashion education. The mythology around fashion was, and still is, built around creative directors, names and individuals. 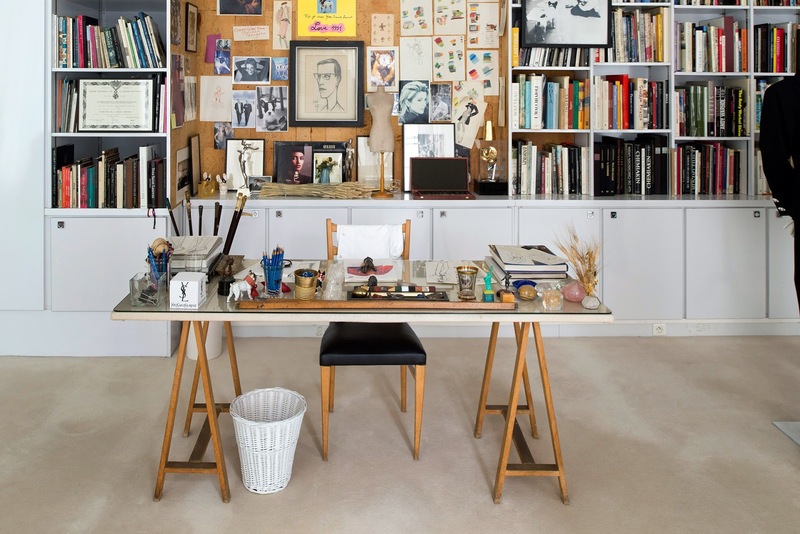 In the past, the creative genius was someone to be admired and emulated from afar. Today, as the society is more interconnected and transparent, the creative genius has lost his aura. Everything seems more attainable and less mysterious. Knowledge is readily available, producing more entrepreneurs and creatives. The reverence of single names is becoming a dated concept and the fashion industry is slowly adapting to participation and collaboration, gradually leaving its celebrity culture behind. In order for this sift in practice to fully embed itself in the minds of the future generation of fashion creatives, a new take on fashion education is needed. The core aim of future fashion education follows the intention of Joseph Beuys’ famous quote ‘Every man is an artist’. Using this analogy, everyone is both a fashion expert and student, shaping how fashion relates to self and others, how it is produced and consumed, influenced by the outside world and by personal decisions. This new education aims to achieve another kind of ‘social sculpture’ to borrow Beuys’ theory based on the concept that everything is art: a participatory, interconnected fashion practice built by a society that engages with cultural and material production of fashion, in an active yet critical way. This evolving ‘fashion sculpture’ is shaped through mutual exchange of tools and by the many hands and minds involved in seeking to develop common solutions while still retaining their individuality. It connects information with those who seek it, as well to those who never knew they could learn something from it. Constant exposure to different worlds enables specialists to become more aware of differences and commonalities, challenging their own ideas and those of others. At the intersection of disciplines, mindsets and institutions, new projects are developed. Future fashion education aims to learn as much as it teaches. Instead of preaching theories and methods, it is open to new ideas, environments and forms of expression. It strives to create mutual benefits, ongoing collaborations and a wider, more concrete stage on which to perform. Away from artificial environments created in traditional fashion schools and in presentations, it seeks to uncover hidden wealth of the real world by encouraging collaboration between participants from diverse backgrounds. It includes the formerly-excluded through widening access to fashion education, embracing the voices of amateurs, artisans, scientists and the public as part of the creative process. Instead of merely skimming the surroundings for inspiration, it seeks to build deeper connections, to establish new communities and to embed itself in local ones, inviting the outside world in. Future fashion education comes in multiple formats, neither seeking to homogenise its participants, nor encouraging hyper-individualism and seclusion. Opportunities for talent are created but past individual achievement matters less than the current potential that each contributor can bring to the team. Education does not only serve to understand the past and the present but also to shape the future, offering new ways of living together. It expects multiple contributions, accepting different thought- and business models next to one another. Participants operate autonomously while being open to collaboration. Traditions are passed on, rediscovered and innovated. From interactive libraries to tangible archives and workshop sessions, knowledge is transmitted in active ways. As the landscape of fashion is changing and students’ interests in acquiring skill go beyond those required by roles in traditional design, higher education has been filling the gap between traditional and emergent practices through experimental and collaborative projects. In the past, courses have focused on partnering with industry insiders such as fashion houses, the offer is expanding to include partners in the fields of creative practices, technology, the sciences and social institutions. Expanded educational offer highlights wide range of domains where fashion knowledge is applicable and acknowledges the work of forerunners who have established their practice at the edges of the traditional field, such as Hussein Chalayan and Iris van Herpen among others. 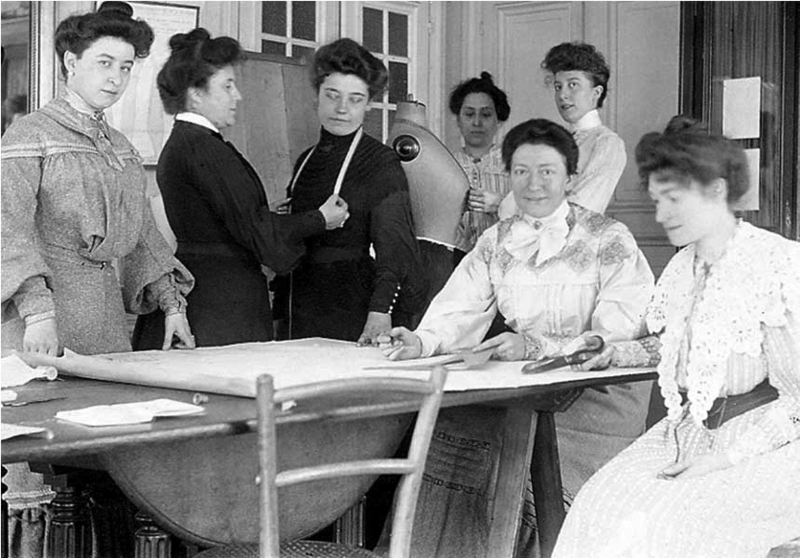 Fashion as a discipline is relatively young and formal education was not established until 1841, when Alexis Guerre-Lavigne, who invented the couture mannequin and the measuring tape, founded his eponymous Parisian school, which has since evolved into ESMOD. The oldest fashion courses in the UK date back to early 20th century when tailors and embroiderers went to acquire their craft in schools as opposed to via apprenticeships. Today, the number of fashion schools and institutions offering fashion courses is still growing across the globe. A greater variety of options is available in the traditional fashion cities, but new courses are starting in countries with a younger fashion history as well. These often follow Western educational models, although some are developing programmes more closely connected with local traditions. Discussions about saturated markets have intensified over the last decade and in order for fashion to evolve, education has to do more than transfer historic knowledge and models that have proven successful in the past. Some schools have started to engage with social responsibility by supporting small businesses and initiatives with projects connecting them to students. The aim is mutual knowledge transfer as well as to open up new pathways for fashion that students could consider upon graduation. Business conglomerates are talking about ‘future-proofing’ fashion whilst sustainability experts talk about ‘educating the public’. Future fashion education still relies on, but is not limited to an exclusive group of experts. It accepts and makes use of our present-day interconnected reality and aims to share knowledge beyond specialist environments, increasing communications, strengthening relationships and benefitting more directly from specialist knowledge that can be gained from other professions. It creates spaces between business and academia, linking craft to innovation and encouraging exchange between experts and public. Projects aimed to popularise open-source manufacturing such as FabTextiles, OpenWear or Kniterate strive to make research more readily available and to promote sharing. They attempt to move away from fashion’s highly competitive and exclusive past towards a more inclusive collaborative future. In line with this idea is fashion’s take on online courses that contain written, audio and video material created by companies such as Business of Fashion and Mastered. Reaching more students, with the possibility of accreditation upon successful completion, fashion education is made more accessible, more flexible and even more open to input from culturally and socioeconomically diverse students. Online courses and open workshops also attract participants from a wider age range, which could gradually change fashion’s obsession with the ‘new young talent’ and allow people from diverse backgrounds and with varied experience in both related and non-related fields to create new fashion projects. 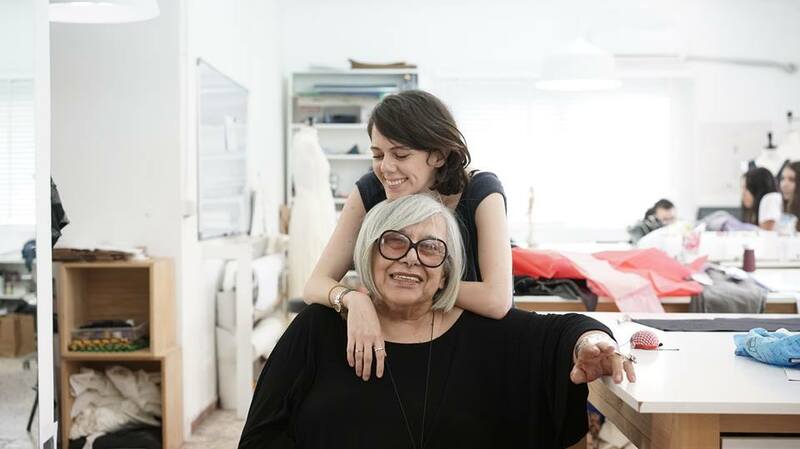 Apart from overcoming ageism and elitism, new open models also serve to educate the ‘uninformed’ consumers by increasing awareness of the creative work behind fashion, supply chains, marketing and cultural contexts. As one of the worlds biggest industries and a form of creative expression that everyone is confronted with, education plays a crucial part in informing consumers how fashion has shaped and reflected cultural shifts and how the production of fashion affects and depends on natural resources, politics and economic influences. In short, fashion education isn’t just about making and craft, it should cover areas such as creative expression, social relationships, global economy and ecology. Creative Space Beirut is a free fashion school in Lebanon for underprivileged youth from divers and sometimes conflicting backgrounds. Founded in 2011 and set up as a Non-Governmental Organization by Parsons graduate Sarah Hermez and her former professor Caroline Simonelli, it combines fashion and social work and operates from a small space in an apartment building. [i] The three-year program, with an interdisciplinary and alternative educational approach, is funded through monetary and material donations. Workshops and fundraising parties are regularly organized for public to meet and support the students. Additionally, at the end of each year, collections produced by the students are exhibited and sold. All proceeds are reinvested in the program, making students not only recipients of social aid but active contributors to their own education and that of future students. The school’s aim is not only to give its students a chance in an elitist fashion world but also to teach transferable design skills that provide them with the means to make change both in their personal lives and in their communities. Parisian fashion schools aim to return to more traditional models of education by reinstating master/apprentice relationships through various programmes. One of these is a six-month programme starting in Fall 2017 at Saint Laurent with students from Institut Français de la Mode and École de la Chambre Syndicale de la Couture Parisienne. The course focuses on sustainability and innovation in couture, aiming to train new designers for the changing landscape of fashion and luxury goods. [i] It includes in-house internship periods that focus on craft and textiles as well as classes provided by the school. Heritage should be preserved while implementing changes towards sustainability, an aim that Kering wishes to attain across the group. Opened in June 2017, New York City’s BLUE/Tatter Textile Library houses book collections and tangible objects in an intimate setting. It belongs to the organization Tatter that seeks to ‘promote the consciousness of cloth by considering, and celebrating cloth’s intrinsic and essential relationship with human life’[i]. It offers workshops that combine lectures and practical work to relearn old textile techniques, creating a three-dimensional experience around cloth. Open only by appointment, the library removes the anonymity of a conventional library and creates a space for personal discovery and study of textile traditions, expanding the reading experience with artefacts to touch. Away from big institutions, Tatter is a small-scale educational offer for guided and self-study that emphasises craft and value, cultural heritage and personal connection to the material world. It passes on the knowledge in an informal way, reconnecting textile culture with personal life. 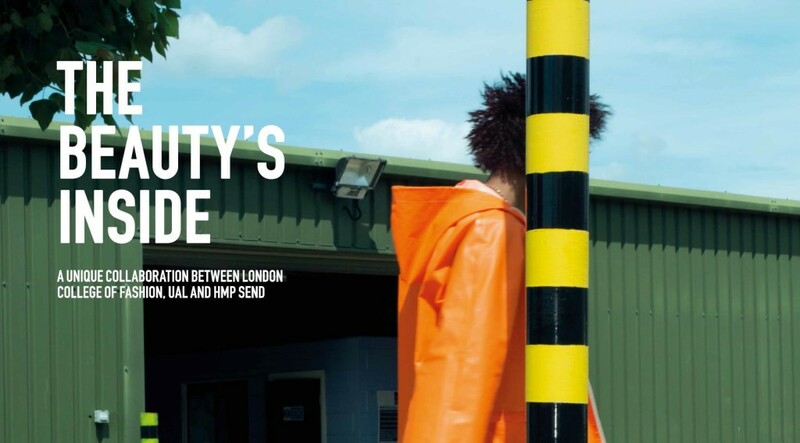 London College of Fashion’s Fashion Education in Prisons Project includes different collaborations where students participate in outreach programs. LCF partnered with women’s prison HMP Send in 2012 to create a print publication titled The Beauty’s Inside. The ongoing collaboration has since produced yearly issues, funded by Sir John Cass’ Foundation and it even won the Times Higher Education outreach award. As a series of weekly morning workshops, LCF students visited the women from Send to discuss art, fashion and beauty along with prison life, former occupations and future aspirations. Collaboratively, they co-created content relevant to them, which was printed in an associated male prison’s Print Shop and distributed to all inmates. In a different partnership with Holloway prison, a group of 25 women were taught manufacturing skills needed for fashion production, which could serve them well in the future, with an increasing number of machinists expected to be needed in the London area. Using fashion’s social potential, these collaborations fostered community among inmates and provided a positive outlook for life after prison, transferring usable skills that help with readjustment into professional life. 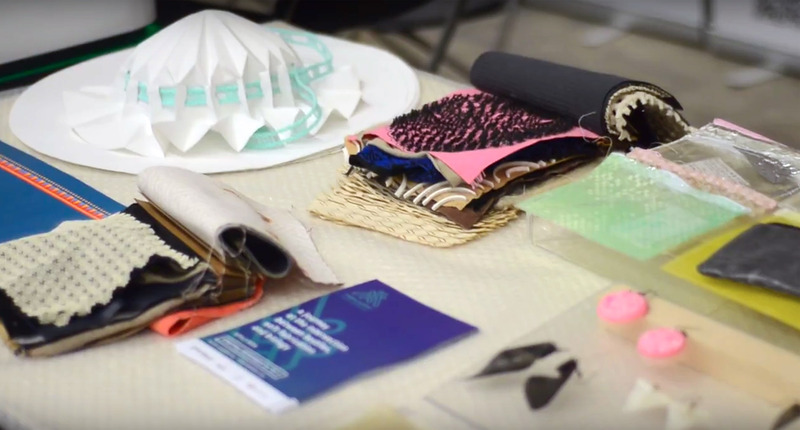 Launched by Pratt Institute with its own and public funding, the Brooklyn Fashion + Design Accelerator supports fashion and industrial designers as well as technologists with resources for further education. It acts as an educational platform, production site and business incubator. Along with providing physical working space, showrooms and retail space, BF+DA offers sustainability consulting, a resource library, contacts to local manufacturers and participatory community events. Under the same roof, research and venture fellows share the space with short- and long-term residents who use the building as a co-working space. They engage in partnerships both within the BF+DA and with other institutions and put an emphasis on ethical and sustainable design and production. A range of events and classes connect residents with other members. FabTextiles is a Barcelona-based experimental research lab for digital fabrication. The aim of the lab is to develop open-source couture as an alternative, sustainable model for future fashion. It provides online files, participates in conferences and offers workshops for textile development, putting theoretical concepts into practice. FabTextiles builds and uses distributed manufacturing infrastructures and knowledge networks, acting locally while being connected to global communities. The lab has a website which serves as a cross-disciplinary education and research platform. It connects different FabLabs as well as projects that are about digital and open-source fashion production and materials. Launched in 2017, its Fabricademy is a 6-month educational program at the intersection of fashion, technology and biology, aiming to educate future multidisciplinary designers with expertise in wearables, new materials and sustainability. Embracing open access and distributed education, courses are available at FabLabs across the world and other institutions like fashion and design schools, creative spaces and artist studios are encouraged to become additional nodes. While it is a tuition-based program, fees vary from lab to lab and scholarships are available. 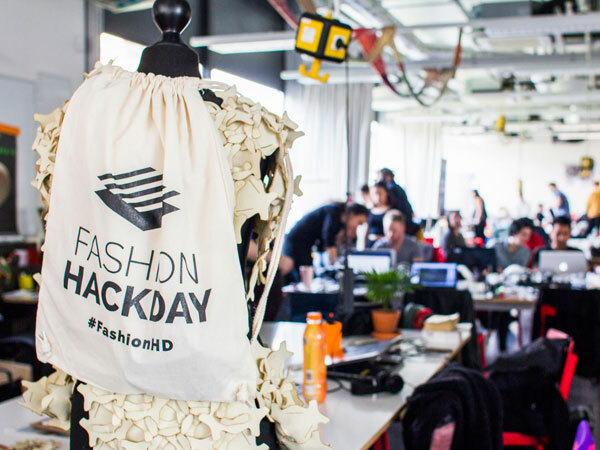 Fashion Hack Day Berlin brings together technologists and fashion designers. The concept is borrowed from programming hackathons where large numbers of people gather to complete projects in a short time-span, usually lasting a day or two. 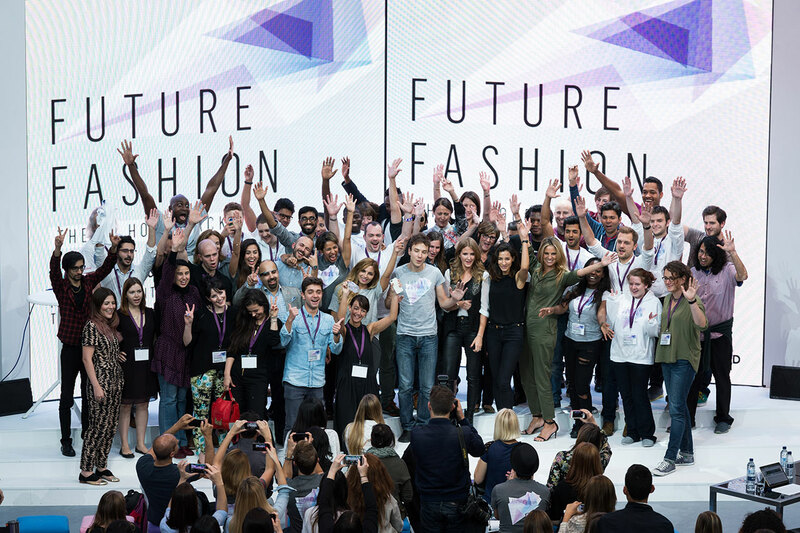 Fashion hackathons aim to create unconventional products through the collision of ideas from the fields of fashion and digital technology. Aimed at professionals and students, especially fashion designers, developers, hackers, coders and hardware makers, autonomous team-work time is supplemented with workshops and motivational speeches. The results of the day are shown to other participants in final pitch presentations. Participants share expertise, learn from one another, test ideas and produce new knowledge. Connecting different fields and producing a great number of contributions, these events do not only serve to put knowledge into practice, but also combine it and open up new areas for fashion to consider. Textile Toolbox is an online ‘exhibition’ showcasing sustainable fashion strategies focused on services instead of products. Created by Swedish Mistra Future Fashion and an international team of TED researchers, it contains a variety of educational resources to create workshops at schools, the general public, design staff and emergent designers. Resources were developed through collaborations between scientists, academics and fashion professionals. They include design principles with best-practice examples, worksheets and feedback cards, workshop instructions including discussion questions, timing, suggested number of participants, space and equipment requirements. Textile Toolbox aims to create an open global network for distributed education and research. Visitors to the site contribute to ongoing research via surveys, sending feedback about workshops, hosting own events and contributing their own sustainable fashion projects to be showcased on the site. An extensive report about the project was published in 2016 and is available online. Due to its hands-on nature, fashion education has taken longer than other disciplines to adopt e-learning. With some courses offered by universities themselves, specialist online platforms have emerged recently. BoF Education is aimed at fashion students and members of the public who want to understand how the industry works. The service is also attracts fashion professionals looking to advance their businesses or seeking to further their education. Courses are divided into modules and contain video tutorials, reading material and exercises, ranging from fashion history to business skills. Taught by industry professionals, certifications are awarded upon successful completion. The courses are entirely self-directed and flexible, which differentiates BoF Education from other e-learning platforms where communication with other learners is an essential component. 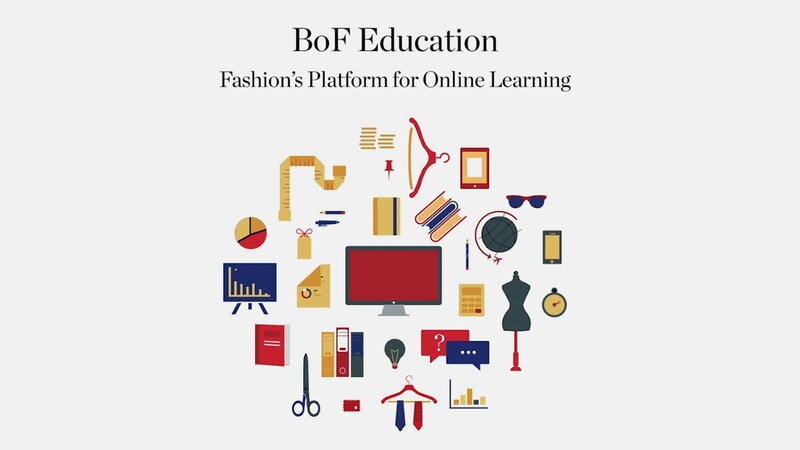 Where BoF Education takes place completely online, Mastered, aimed at photography, beauty, styling and design professionals, combines e-learning with in-person meetings and group experiences. Videos require active participation from the learner and the course adapts to individual pace through one-to-one coaching to set personal goals and track progress. Fellow learners meet in person and work as teams forming professional networks that last beyond the duration of the course. Swedish Sustainable Fashion Academy’s online course ‘Sustainability Fundamentals’, is a training tool for those within and outside of the industry that maps out sustainable alternatives for brands and retailers. SFA also offers in-person training and consulting at all levels, from schools to multinationals and cooperates with them to develop new programs.